Nice selection of Honey Bush that shares tints of purple predominantly when new leaves are unfurling. The enormous blue/lavender serrated leaves are amazing. Lower growing than either the species or ‘Antonow’s Blue’. To 4′ tall (usually shorter) by at least 6′ wide. Red flowers are produced on the black scape that can follow mild winters. Technically a subshrub as it can freeze to the ground and fully recover from the root in a single season. IF it has been well established in its first season. 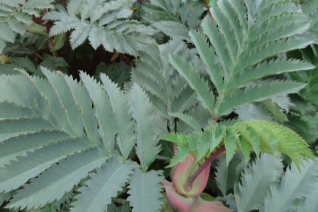 For that reason we only sell Melianthus in 2 gallon sizes. A larger plant establishes faster and has more mass going into winter. Plant in a protected location- against a wall or with light overstory protection. Mulch for the first winter. Freezes to the ground at prolonged temperatures below about 20ºF. Re-sprouts in mid-late spring. Water and fertilize to speed the recovery. South Africa. Big and bold and blue this remarkable plant known for its enormous pinnate foliage makes a statement. To 7′ tall and as wide in time. Following mild years madder red rubbery flower spikes bear black flowers. yep. 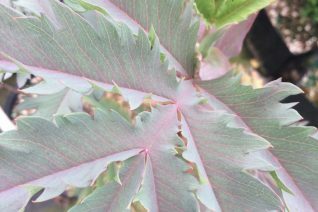 Its very important to establish your Melianthus happily before its first winter. That means you give it rich, well drained soil in full sun with REGULAR summer water. The bigger the root system the more vigorous the plant will return if frozen to the ground (below 20ºF). Luckily in the city this usually happens every four years or so. In colder outlying areas plant it next to a hot south facing wall and nurture the hell out of it. Mulch before arctic episodes is a good thing. Moderate deer resistance. South Africa.